What are the chances of walking into Tesco and finding a Scarecrow, Ood, Cyberman, Silurian and a Clockwork Robot? Most days it’s probably quite unlikely. 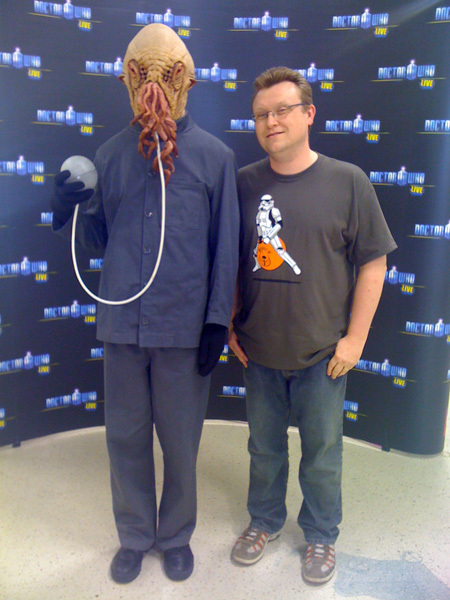 On this occasion though, a promotion for the Doctor Who LIVE event provided a chance to stand in a queue and have pictures taken with these very beasties. Alas, poor organisation meant I only got pictures with three of the five – I only came out for milk, at the Stockport Tesco Extra, and didn’t expect to stand for a whole hour waiting for a photo opportunity. Who knows what might happen next time I take a trip out for fish fingers and some toilet roll?! This entry was posted in General on September 3, 2010 by Paul B.